In purchasing equipment for the outdoors, I always use the same thought process. How often am I going to upgrade my equipment based on the new radical improvements that the manufacturer will come out with? How long before my existing equipment will become obsolete and I will have to replace it? How long will it be before I have a disadvantage with my existing equipment? When the time came to choose snowshoes, I decided that I would choose the best snowshoes that I could afford based on the use of the snowshoes. Snowshoes allow you to go to places in the snow that normally you wouldn't be able to get to and snowshoes also allow you to climb steep hills and mountains. There are many snowshoe features to consider when choosing snowshoes and all the options available are important. What type of activity are the snowshoes going to used for? Recreational - Are you just going to using the snowshoes on a golf course, on a flat trail, in the local park or just easy hiking? The recreational snowshoes are the least expensive, lightweight and have an easy binding system to hold your boots to the snowshoes. Choose the smallest snowshoe that will support you since you will generally be on packed snow and will require less floatation on powdered snow. Backcountry - The backcountry snowshoes allow you to climb steep terrain, are constructed better than the recreational snowshoes and have more sophisticated binding systems. Choose a snowshoe that will moderately support your weight and size since you will be on powdered snow. If you are mountaineering, you will require much more floatation for deep powder and a larger snowshoe. Fitness - The fitness snowshoes are for running in packed or groomed snow. Choose the smallest snowshoe that will allow you to run comfortably. What do you weigh? Depending on your weight and the weight of anything carried (such as a backpack, etc. ), the snowshoe must be the correct length to keep you from sinking in the powdered snow. If you are only going to be snowshoeing in packed powder, possibly choose a smaller length snowshoe. Please keep in mind that these are only recommended sizes. Each snowshoe manufacturer might have a different chart based on the shape, the design and the materials used in their snowshoe. Keep in mind that some snowshoes have removable and add-on tails. So, you can start with a 21"-23" length snowshoe and add a 4"-8" tail. These type of snowshoes give you the most flexibility. What type of frames & decking? Most snowshoes have aluminum frames and rubber decking while some snowshoes are completed manufactured from plastic. I use a plastic snowshoe because it is light, can use a smaller size and it is adjustable (can add different size tails for different snow conditions). The type of snowshoe you decide to use is a personal decision. 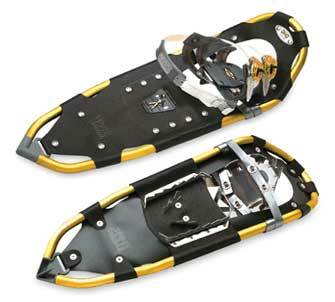 Some snowshoes have crampons, braking systems, adjustable heights or angles for the boots and many other features. Decide what features you need based on the type of conditions you will be in. The main consideration for bindings are: Can I adjust them while wearing gloves or mittens? Are they easy to put on and take off? Are they adjustable for all the types of footwear that I might wear? Are they comfortable? Some outdoor retail stores will rent the snowshoes to you and apply the rental toward the purchase price. It is always best to try them out before buying them if you possibly can. Hiking poles have to be chosen for snowshoeing. Don't forget to learn how to maintain your snowshoes correctly because incorrect methods might damage your snowshoes and choose snowshoes wisely.